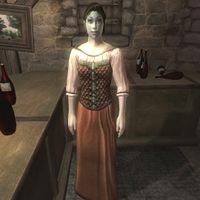 Davela Hlaren is a Dunmer innkeeper at the Imperial Bridge Inn. Davela buys ingredients and potions and sells food and beds. She is also an advanced trainer in Hand to Hand. Davela can always be found behind the counter at the inn. She will offer her services at all times. Davela wears a quilted doublet, tan linens and a pair of doeskin shoes. She also carries a small sum of gold. When you ask her about beds, Davela will tell you that "It's not the nicest bed in Cyrodiil, but it's cheap. 10 gold, and it's yours for the night." unless you have already rented the room, in which case she replies "You've already got the use of the only beds I have. What more do you want?" If you rent the room, she will tell you "Very well. You can use either bed on the top floor. Oh, and do watch your step." or, if you don't have the necessary gold, "You don't have the money. I'm not just going to let you sleep here for free." Davela also points you in the direction of Helvius Cecia for master-level Hand to Hand training: "You should consider going to Bruma, and talking with Helvius Cecia. He can teach you more than... well, probably anyone." and "Talk to Helvius Cecia in Bruma. He's your best bet for learning more about hand to hand combat." Hand to Hand Training: A Master of unarmed combat wants you to try to hurt him to prove you deserve his training. When renting a bed from Davela, even if you don't have the 10 gold necessary for a room, she will still unlock the door and allow you to sleep in the "rented" bed. Esta página foi modificada pela última vez à(s) 18h34min de 25 de maio de 2013.